Americans tend to believe illegal immigrants should be treated well. But they also would prefer for them to stay out of the country, according to a recent CBS poll. But a majority (51 percent) also thought the border wall is a good idea. A large part of the poll probed respondents’ views on the issue of some illegal immigrants getting separated from their children in detention facilities, a situation that has recently affected more people because of President Donald Trump’s more stringent enforcement of existing immigration laws. While most Americans (77 percent) agreed the problem needs to be solved, the most popular way to handle it was deportation. Even fewer (15 percent) supported the current policy of detaining the families either separated or together. The most popular option, supported by 48 percent of respondents, was to return the families to their countries of origin. That’s also what the president has been pushing for. “People must simply be stopped at the Border and told they cannot come into the U.S. illegally,” he wrote in a June 25 tweet. And that’s normally the case. When a person enters the country illegally and is caught near the border, he faces expedited removal, and a Department of Homeland Security (DHS) official can promptly decide to send the person back to the country of origin. But there’s a loophole in the system, which has been heavily used by families from Central America in recent years: If the border-crosser asks for asylum, the official has to determine whether the person has a “credible fear” of being tortured or persecuted if returned to his or her country of origin. If yes, the person is detained and waits for a hearing in front of an immigration judge. The credible fear check should determine whether there’s “a significant possibility … the alien can establish eligibility for asylum,” the law states. But there’s a great discrepancy between the number of people who pass the check and those who are actually granted asylum. 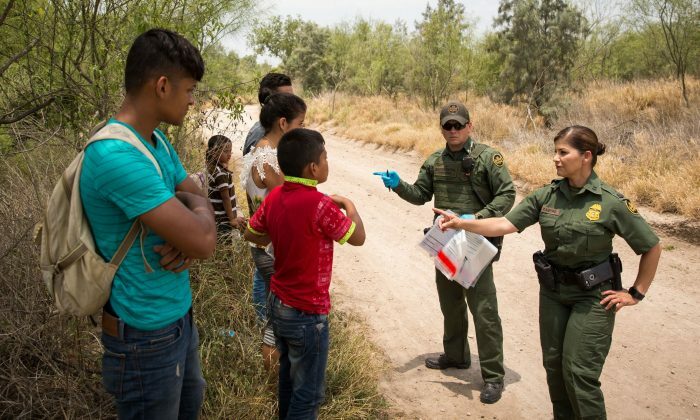 Asylum officers have been granting 75 to 90 percent of the requests, according to Art Arthur, former immigration court judge and current resident fellow in law and policy at the Center for Immigration Studies (CIS). Meanwhile, only about 20 percent of asylum applications were approved in 2017. Seeking asylum, however, doesn’t seem to be the priority for the current wave of families from countries like Honduras, Guatemala, and El Salvador. Due to the 2016 amendment to a 1997 court ruling, the Flores Settlement Agreement, minors can’t be detained in most DHS facilities for more than 20 days—an impossibly short time to complete a proceeding at the hugely overburdened immigration courts. That means they then have to be either sent alone to Health and Human Services (HHS) facility, or the whole family is released into the interior of the United States with a court date set for possibly years down the road. And when it comes to the families in this situation, some 80 percent don’t show up for their court hearings, according to Thomas Homan, deputy director of the Immigration and Customs Enforcement. On June 11, Attorney General Jeff Sessions tightened the credible fear criteria, stating that individuals who are fleeing crime and domestic violence (a common theme among the Central American migrants), but who are not persecuted by their own government, do not fall under the asylum criteria. There’s another way the children of illegal immigrants get separated. When the parents get charged with a crime, including the misdemeanor offense of illegal border crossing, they get transferred to the U.S. Marshal. Children can’t stay with them in the adult detention facilities and thus are transferred to an HHS facility. More than 2,300 children have been separated this way since May, when the administration started to prosecute all illegal crossings. Trump attempted to end the practice with an executive order on June 20 that prioritizes keeping the families together while detained. Epoch Times reporter Charlotte Cuthbertson contributed to this report. For nearly 18 years, the “610 Office” has been responsible for the mass surveillance, arrest, detention, and torture of millions of Falun Gong practitioners in China.